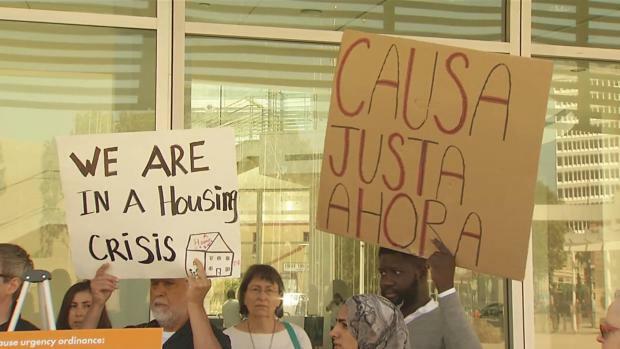 The San Jose City Council will on Tuesday vote on whether to immediately enact its just-cause ordinance for renters. The new law would requires landlords to give a specific reason when evicting tenants, and is considered a major step forward for people who rent homes in the South Bay. Bob Redell reports. The San Jose City Council has already approved a tenant protection ordinance, but now supporters of the new law said it needs to get on the books faster. Supporters claim a delay could give unscrupulous landlords the opening to rush the so-called no-cause evictions. Lawyers that handle reports of evictions without cause said they have already seen an increase in complaints in the past the three weeks. San Jose-resident Robert Aguirre, who has been living for the past two years at a Willow Glen condominium, was surprised when his landlord gave him an eviction notice, citing no cause. "We have been paying rent on time and in full every month," Aguirre said. The San Jose City Council has already approved a tenant protection ordinance, but now supporters of the new law said it needs to get on the books faster. Marianne Favro reports. Aguirre is not alone. The Law Foundation Silicon Valley said ever since San Jose's new tenant protection ordinance was approved they have seen an increase in no-cause evictions. "I received 13 cases that were no-cause evictions," said Melissa Morris with Law Foundation of Silicon Valley. Renters rights advocates at city hall Monday stressed the need to make the new law an urgency ordinance that would go into effect immediately. If the law stalls, landlords would have at least 37 days to unjustly evict tenants, according to advocates. A spokesman for the California Apartment Association, which opposed the new ordinance, said declaring this an urgency ordinance would not give landlords enough lead time to learn the full details of the new law.